Hand selected and chosen with care in Brazil: click on the video above for a quick look around the Taj Mahal Quartzite quarry. Due to its uniqueness and durabiity, Quartzite has become an extremely popular natural stone for various applications throughout the home — countertops, fireplaces, and accent walls, to name a few. Quartzite is extremely compact, made up almost entirely of quartz. A pure Quartzite typically ranges from white to grey in color but will often occur in various color shades due to the mineral content. Taj Mahal has soft cream tones and very subtle light brown and gold veining. It has become a highly sought after natural stone due to its resemblence to white marble. But because Taj Mahal's makeup offers a much more dense profile than Marble, our clients are able to achieve the unique, neutral look Marble provides without any of the etching or staining. Available in both 2cm and 3cm thickness, in polished and leathered finishes, our large collection of Taj Mahal is not to be missed. 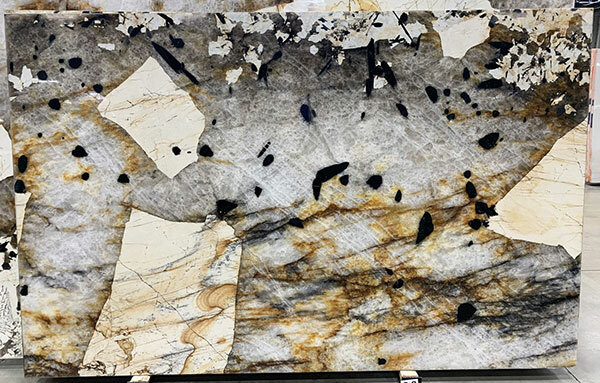 We invite you to stop by one of our showrooms in Denver, Dallas, Fort Worth, Phoenix or Salt Lake City or click here to view this beauty of a Quartzite in slab form. Interested in learning more about Quartzite for your home or for your next commercial project? Check out The Natural Stone Institute's Definitive Guide to Quartzite.